Apple growers are seeing better returns for their products thanks to savings being made by a leading fruit packing company using Ulma Packaging’s bespoke Atlanta tray-less flowrapper solution to wrap apples.in numerous formats – 2 x 2, 3 x 2, 4 x 2 & importantly 4 x 1 with or without trays all on the same machine. Cottage Farms in Kent, which has been growing and packaging fruit for over 50 years, is about to purchase its fifth Ulma machine following significant investment in new facilities and equipment because of growing demand for its wide variety of apples and pears. The business packs and supplies top fruit direct to one of the UK’s largest retailers and is passing the savings it is making on to its 22 English growers after switching to Ulma’s Atlanta tray-less flowrapper last year when the supermarket giant told its suppliers that flow wrap was its pack of choice. Cottage Farms is now committing to another machine from Ulma to keep up with increasing demand. Cottage Farms’ owner, Chris Browning, explained: “Historically polybags were the preferred option but the reason for moving over to flow wrap was customer choice. We decided Ulma’s machine suited our requirements best and it worked very well for us last year. We are purchasing another Ulma flowrapper for the new packing facility due to start operation in early 2014. “We pack 10,000 tonnes of apples a season and the Ulma equipment is making significant savings, which we are passing on to our growers, because the output of the machine is more than double than the old polybag machines. It is currently flow wrapping between 40- 45 packs per minute but with the new machine and the possibility of an automated infeed we could see throughput of upto 60 + a minute.”Another key benefit says the Cottage Farms owner is the ability to print required information directly onto the flowrap pack itself – rather than having to deploy staff to apply individual labels as was the case with polybags – plus improved pack presentation. Ulma’s Atlanta tray-less flowrapper is offered in a variety of configurations based on apples arriving in cardboard boxes, pallet boxes/plastic crates or straight from the grading process. As a further enhancement to the process, Ulma can also offer further line solutions with fully automatic crate packing and palletising. Over the next few months Ulma will also be announcing an improved operator-less auto in-feed offer for the Atlanta wrapper in partnership with a leading European fruit handling machinery systems supplier. 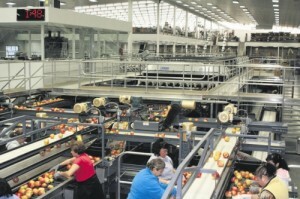 This will further enhance the offer with the reduction of operator intervention to feed the apples into the system. In addition to providing a bespoke solution for apple packing, pre-printed roll stock film is used to make the bags, which can subsequently be labelled & coded immediately prior to flowrapping, this allows labelling to flat film – avoiding labelling to uneven or wrinkled surfaces after wrapping thus enhancing the pack appearance. The equipment is designed to produce a horizontally sealed bag using a series of bespoke features on the machine to gently wrap the apples without any damage. From the moment the apples are placed in the machine care is taken at every point of contact to eliminate the risk of bruising – from the specifically designed soft in-feed through to the film application using a series of soft brushes to gently guide & separate the packs into the sealing jaws. Ulma has a long and impressive background in the fresh produce arena and is an approved supplier to multiple retailers and others involved in the packaging of a cross-section of products including tomatoes, potatoes, onions, mangos, avocadoes, oranges, lemons and even kiwis.